My family has now purchased five or six vehicles from Tim over the years. I was nervous about going through the process this time without my dad by my side or any other help. But David and Tim were both very laid back and incredibly easy to deal with. I knew there was nowhere else I even wanted to consider buying from and that they would absolutely have something that worked for me. Sure enough, Tim had a gorgeous 2007 Ford Edge in the best shape possible. This car is pristine and drives like a dream! David was the most amiable and personable guy I could have hoped to work with. He was nice enough to show me more than one vehicle that might work for me and once I settled on the Ford, he and Tim set out to get me the best financing available. I'm incredibly impressed with their efforts. After purchasing as many vehicles from them as we have, it's easy to say they only have the best. There isn't a single vehicle on their lot that is less than excellent. They work har d to create an easy and comfortable atmosphere. And I can promise you, if you go back to them they'll take care of you. GREAT! By Aaron T. from Lincoln, NE | January 3, 2017 We were looking for a mini-van, and had searched for a few weeks. We luckily ran across a new listing from Miracle Mile Motors that checked most if not all of the boxes for things we were looking for in a vehicle. It didn't take long for us to decide to purchase, and Greg and Tim both made it very easy. We were able to come to an agreement that we all were happy with in a short amount of time, and without any "bickering". The process was great, they respected our wishes on our trade-in and worked with us to find middle ground. Great experience, will definitely look there in the future for vehicle needs. Rating from Aaron T.
Jan. 5, 2016 J W. reviewed your business on Yelp 4 Stars (4/5) I've known these folks for a long time. They sold me a Chevy truck that lasted for 19 years. All it needed was a starter at one point. Realize that they provide a used car experience of quality - not a new car or private owner experience. That said, maybe your auto will be a bit higher priced, but worth it in the long run. Finally, really nice people to work with. Dec 28, 2015 Local customers reviewed your business on Cars.com 5 Stars (5/5) Purchased a 2013 Infiniti G37xS sedan 11/30/15. Miracle Mile and Mr..Richter were honest, exhibited a straight forward, business like approach to the sale of the vehicle. No problem having the G37 undergo a pre-purchase diagnostic check by a third party. Vehicle was detailed and cleaned prior to delivery. Paperwork and transaction of the sale was extremely quick and efficient. Feb. 22, 2016 Daniel Miner reviewed your business on Google Maps 5 Stars (5/5) Great service, very professional and friendly. This dealership is about 4 hours away from our home but had the exact vehicle we wanted. We called as we would be arriving close to closing, the guys let us know they were happy to stick around and let us check out the vehicle. The van was exactly as described on line, actually, better than described. It was a great buying experience all around, I would definitely return here when I am looking for another vehicle! 1 Review Apr. 24, 2015 Mike Hodges reviewed your business on Google Plus Local 5 Stars (5/5) Good inventory, fair prices and friendly people to deal with. What more can you ask for, I love my truck and will shop there again. July 10, 2015 AlieND reviewed your business on Cars.com 5 Stars (5/5) Dealt with Tim. He was very easy to deal with and flexible. I flew into Nebraska and they picked me up from the airport. I felt I got a great car for a great price. Its been over a week and 1000 miles, and the car is running well. Overall, I was surprised by how easy and relaxing the whole process was. Thanks! Jan. 31, 2015 Mandi Thompson reviewed your business on Facebook 5 Stars (5/5) This was the best buying experience I've ever had from a car dealership. Thank you so much for all your help. Mar. 29, 2015 Joe Sigona reviewed your business on Google Plus Local 5 Stars (5/5) Miracle Mile Motors is a great place to buy a car or truck. Tim Richter is a pleasure to deal with without any hassle. Tim does exactly what he agrees to do and then some.  I have purchased many vehicles over the years and know great service. I will recommend Miracle Miles to my friends and family. They have exceptional vehicles to sell. May 7, 2015 Matt Erickson reviewed your business on Google Plus Local 5 Stars (5/5) I recently purchased a 2001 Corvette from Tom Worster of Miracle Mile Motors and couldn’t be happier with the experience. As an out of state buyer, I had a number of questions and requested pictures and video be taken prior to making the trip. Tom respected the time and effort I’d be making to travel that far and made sure to provide me with all the information I needed. I arrived and the car was as advertised. The detail shop did an excellent job prepping the car, inside and out. I had looked at dozens of cars with similar options, year and mileage and their asking price was very fair. I drove the car back 400 miles and it ran perfectly! Overall, a very good experience and I’d certainly buy another vehicle from them again! Great customer Service! Julie's Overall Rating 5.0 Customer Service: 5.0 Buying Process: 5.0 Quality of Repair: 0.0 Overall Facilities: 5.0 by Julie from Lincoln, NE | April 8, 2015 I was referred to Miracle Mile Motors by a friend. I worked with Tim Richter and he was nothing but professional and friendly. He made the process of buying a car very easy. From the time I walked in the door, I was greeted by a friendly smile and hand shake and the service I received was outstanding! They had all the information on the car I wanted and answered all my questions. They even let my own mechanic check it out! I feel I got a very fair price on the trade in and the financing was very easy. 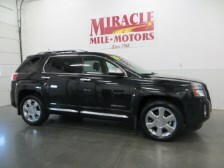 The next time I am looking to purchase a car, I will definitely go back to Miracle Mile Motors! I would recommend that anyone looking to purchase a vehicle, go to Miracle Mile Motors and give them a chance! At Miracle Mile Motors we are proud of the quality used cars we sell and our dedication to serve the needs of our customers. This is reflected in the amount of repeat business we receive. Whether this is your first purchase with us or one of many that you’ve had, you can count on our dedicated sales staff to make it the best buying experience possible. 1 Review Nov. 4, 2013 Jonny reviewed your business on Cars.com 5 Stars (5/5) I found this vehicle on the internet. When I called they gave me an honest evaluation of the truck. Since I had fly from south Mississippi I had to call them several times to confirm the details. They were prompt to answer calls. They picked me up at the airport on time. Everything went as smooth as glass. I drove the 1987 El Camino 1050 miles back to Miss. without any problem. Wish I lived closer. Would not hesitate to buy another vehicle from them. P/S their website is first class. Jeanette Beda May 2014 Bought a 2012 Lincoln MKX from Miracle Mile Motors in Lincoln, NE. Tim Richter was the salesman and we could not have been more pleased with the service we received. We loved the "no pressure" and not needing to meet with "10 different salespersons" in order to learn about the vehicle. They went out of their way to meet our needs. 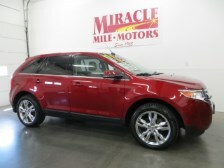 I would highly recommend Miracle Mile dealership to anyone who is looking to purchase another vehicle. Five Stars! Jan. 8, 2014 Nitro reviewed your business on Cars.com 5 Stars (5/5) They had what we wanted, They treated us the way we wanted to be treated, They answered all the questions we had, They all were Polite, Promt, and Professional, They did what we asked, We'd do it again even though they are 520 miles or 8 hours away! A Google User a year ago- When I found out that a used car dealer in Lincoln had the exact car I wanted, I was unsure how it would go. But dealing with Tim was great and I usually hate the car buying process. Asked for his best price on the car, he gave it to me and it was a fair price for both of us. Tim's an honest guy and is building a very nice dealership in Lincoln. I highly recommend. 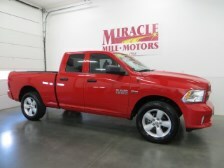 Rachel D 2 weeks ago- Miracle Mile Motors had the exact vehicle I was looking for. Living 4 hours from Lincoln it was hard to find a time to make the trip work into my schedule, but they were very accommodating and set up a special time to meet. I received great customer service, a great vehicle, and a fair price! It was definately worth the drive!! Karla Burkman 4 months ago- They whole staff at Miracle Mile Motors is kind and helpful. I simply told them my price range and what I was looking for and they came through within a day! It has been 4 months since I purchased my vehicle and they still helped me when I needed it! When they say 'call us anytime' they really mean it! 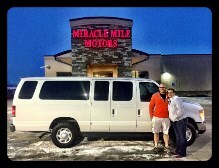 Thank you Tim R. @ Miracle Mile Motors! It was a very pleasant experience, and Tim Richter and Tim Lockhart we very accommodating and answered all my questions. Very informative. I recommend Miracle Mile Motors to you and all my friends. Thank you all for you help with a positive experience at your establishment. A Google User a year ago- I just bought a 2008 Honda Accord from Miracle Mile Motors and I love it! 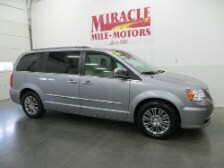 I had a wonderful experince while shopping and buying the car at Miracle Mile Motors. They have a great selection and great prices. The staff is also friendly, patient, caring and honest. 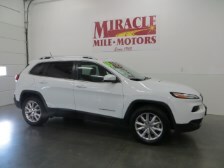 I know that the next time I buy a car I am going to Miracle Mile Motors, or if I hear of someone looking for a new car I would tell them they have to go to Miracle Mile Motors. It was a wonderful experience! Jan. 23, 2014 Momof3 reviewed your business on Cars.com 4 Stars (4/5) I had a nice experience at Miracle Mile Motors. Tim Lockhart was extremely accommodating in allowing me to drive the vehicle before I purchased it and let me keep it overnight. It allowed me to get a true feeling of what it would be like to own the vehicle. Tim Richter was patient during the paperwork process and friendly. We originally purchased the extended warranty, only to change our minds, and canceling the warranty within the allotted time was not a problem. One thing I would have changed during our experience would have been on the vehicle pick-up day. The truck was clean and my plates were put on for me, however, the gas tank was not filled up. As a small business owner myself, I think that would have been a respectable service to provide my customer. May 23, 2015 Kim Ringo Bright reviewed your business on Cars.com 5 Stars (5/5) Tom Worster and Tim Richter are awesome guys to work with! No pressure!! I was a bit skeptical of buying from a used car lot but after reading all the awesome reviews I decided to drive out there and test drive a couple of cars. The buying process couldn't have been more painless. I was in and out within a couple of hours. Tim shopped around and got me a better interest rate than my bank offered. Tom had my new Cadillac SRX sparkling clean! The facility is super clean and looks brand new! I would highly recommend them to any of my friends! AWESOME!! !